If you walk there the way I did, coming along İstiklâl Caddesi from Taksim, you will turn left at Galatasaray Meydanı onto Yeniçarşı Caddesi, which becomes Boğazkesen Caddesi. You will walk down the hill. 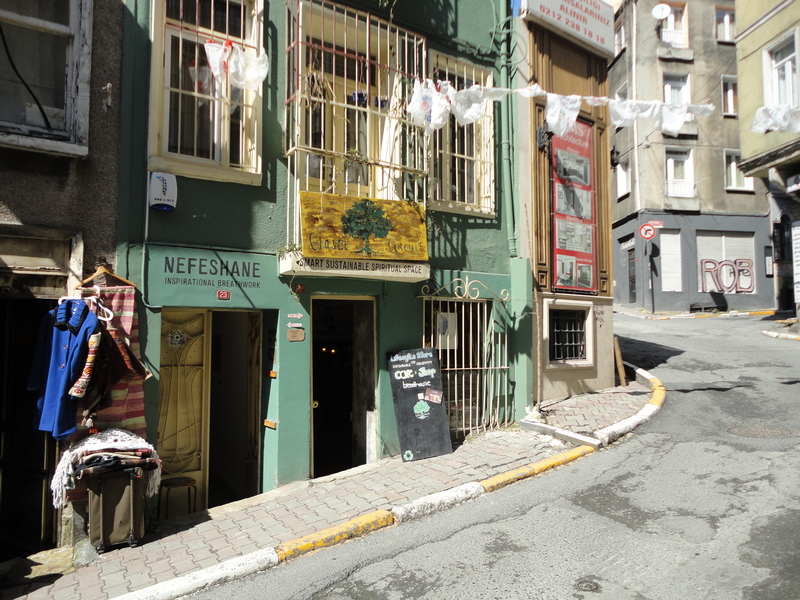 You will take the second left, far down the hill, onto Bostanbaşı Caddesi. Number 23 is near the end, on the left. I did not remember the number, and I missed the place on the first pass. 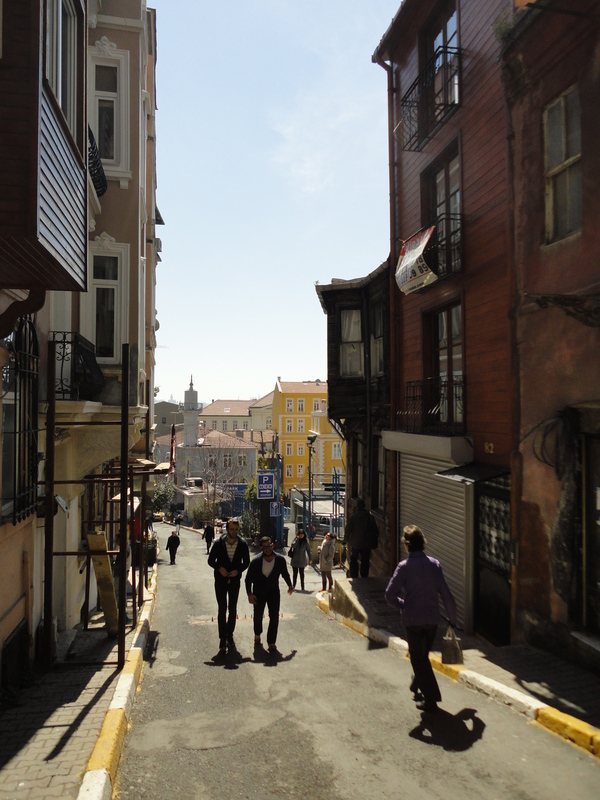 One could have taken the first left, onto Hayriye Caddesi, and followed it around to the right. 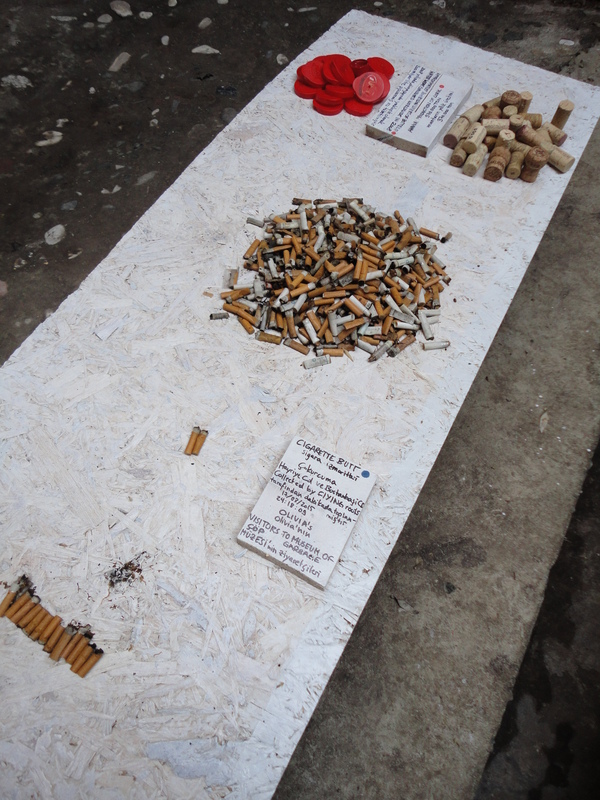 Is the garbage exhibition informational? scientific? artistic? It is fit for a museum in the true sense: a house of the Muses, a place for reflecting and thinking. Do you carry a canvas bag? My spouse and I do, along with string bags, which are occasionally admired by other shoppers, as well as shopkeepers themselves. We never see other shoppers using them though, and we never see a shopkeeper hesitate to put a purchased product, even only one, into a new plastic bag. I think it just never occurs to people not to take something that is “free,”—just as it never occurs to them to take the stairs rather than the lift, or to walk rather than take a bus or a taxi. If I were writing in the United States rather than Turkey, I would give driving as the normal preference to walking. People love driving in Istanbul too for some unknown reason, though car ownership must be lower than in the US. My canvas bag comes from the United States. 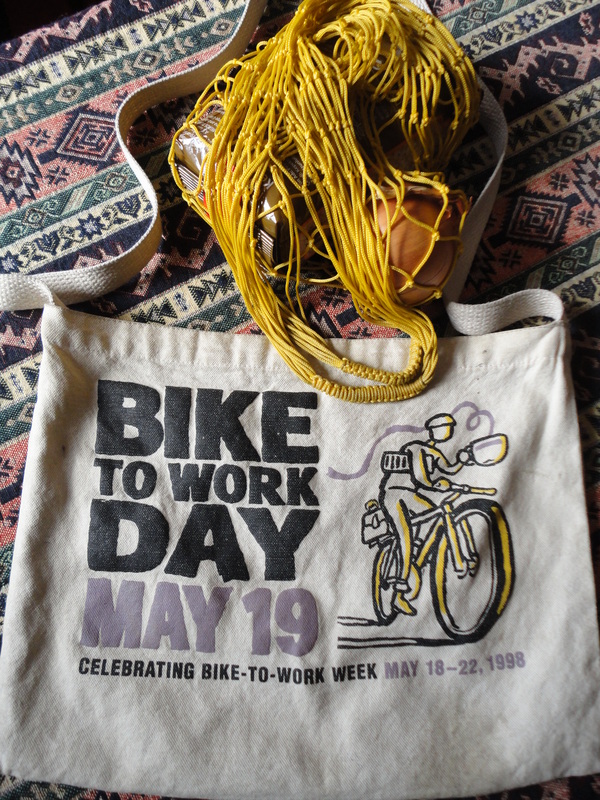 It was a freebie promoting Bike to Work Day, May 19, 1998. I did bike to work that day; but I did this every day, up the hill to the Mathematical Sciences Research Center in Berkeley, California. However, my bicycle came to California by airplane from Urbana-Champaign, Illinois. That flight cost some jet-fuel. Then again, I had actually ridden my bicycle along snowy roads in order to get to the Champaign-Urbana airport. Few people are ever going to do such a thing. 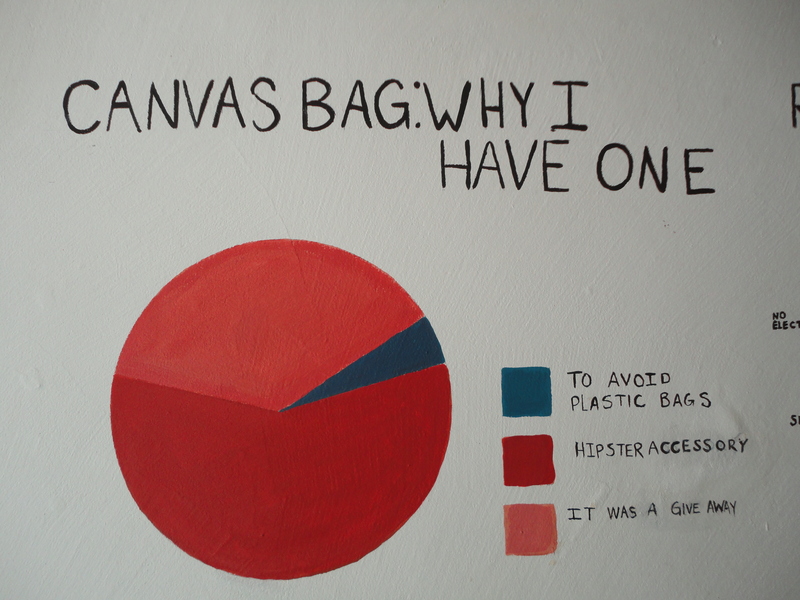 As to the Garbage Museum’s question of why I have a canvas bag, my answer is all three of the alternatives offered. I do wish to avoid using plastic bags, but the canvas bag was a give-away too, and it is also at least some kind of accessory, in the fashion sense. Out in the garden, the garbage exhibit reminds me of some of my seniors, who sought the peace of nature in a house in West Virginia, and who created an organic garden there, but who nonetheless, for years, threw their cigarette butts into the lawn, until my cousin pointed out that it was disgusting, and the complaint stuck. The garbage exhibit venue also houses a small cafe, to which I brought my spouse later in the afternoon. The exhibition curators doubled as servers, providing us with delicious coffee and banana bread. 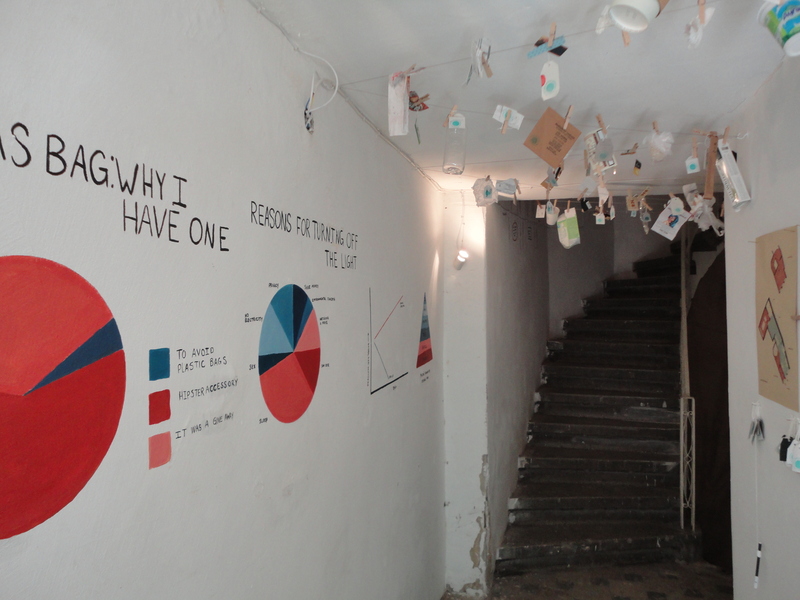 But there is nowhere to stop when thinking about waste. Should we prefer domestically grown tea to imported coffee? Does such a concern become trivial when the forests around Istanbul are being razed for a new airport (Istanbul’s third), a new bridge (the Bosphorus’s third), even a canal to bypass the Bosphorus? 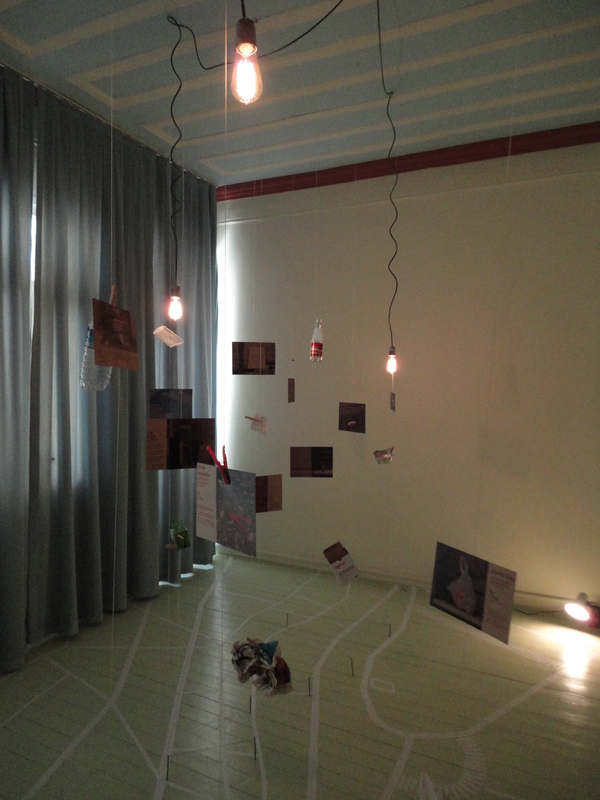 The upper floor of the exhibit: an annotated collection of trash! 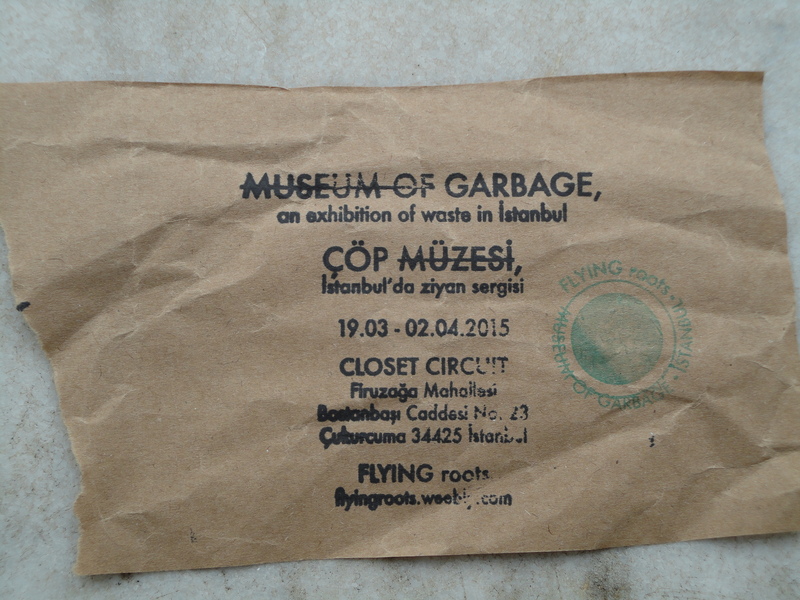 This entry was written by David Pierce, posted on March 23, 2015 at 12:35 pm, filed under Education, Istanbul, Nature, Turkey, Visual Art and tagged 2015, Çukurcuma, Flying roots, garbage, Museum of Garbage, trash, waste. Bookmark the permalink. Follow any comments here with the RSS feed for this post. Post a comment or leave a trackback: Trackback URL.